During the 15 years that John Fass lived in the Bronx YMCA he worked in Manhattan as a typographer for major Manhattan advertising companies. He worked in the type composition shops for these companies, including Young and Rubicam, one of New York's largest advertising firms. John's responsibility was to render the ad designer's copy into type metal with "proofs on the desk in the morning." It was night work. He worked while the ad executives slept. In the mornings, after work, he returned to his room at the Bronx YMCA where he printed mini masterworks on his table-top printing press. 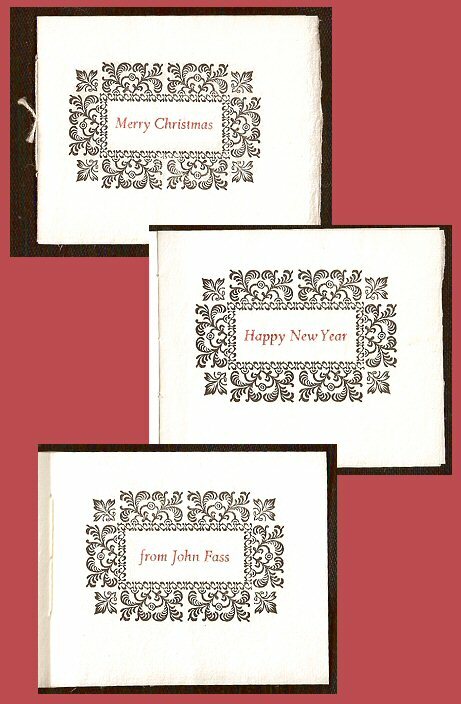 A library in Portland, Oregon, recently exhibited a collection of Christmas cards printed by John Fass in the Bronx. That exhibit is Here. I have a few more of those cards below.